There are around 100 species of freshwater and sea-water Angelfish. It is an interesting tropical fish due to its unique shape and size. Angelfish is flat and round like a disc and it has triangular fins! Sea-water Angelfish are the most exotic and beautiful tropical fish available almost in every ocean. Rock beauty, Queen Angelfish, Blue Angelfish, Gray Angelfish, French Angelfish, Cherub fish and Flame-back Angelfish. They usually eat both animals and plants. More than 95% of the Angelfish feed on sponges. The jaws of Angelfish are adapted to the sponges and have become protracted and have the ability to eat sponge pieces, by secreting a thick coating of mucous on them. The reproduction of sea-water Angelfish depends on the species and the region in which these species live. 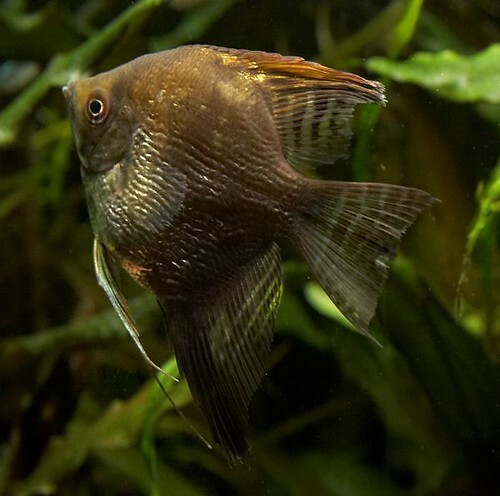 This variety of the Angelfish is found in freshwater, usually in the Amazon river. Breeding the freshwater Angelfish as an aquarium fish, is possible. The species of freshwater Angelfish are as wild type, gold, zebra, black laced, marble, ghost and gold marble. These species have resulted in crossbreeds due to mutation over years. > The scientific name of Angelfish, Pterophyllum scalare, is derived from the Greek words Pterophyllum meaning 'winged leaf' and scalare which means a flight of stairs. The dorsal fins look like a flight of steps or ladder and the fish is leaf-shaped. The fins are narrow and scoop shovel shaped. > The shape and size of Angelfish varies according to the species. > Angelfish belong to the Cichlidae family and belongs to the Cichlid family. > The lifespan of Angelfish is 10-15 years. > Angelfish is a cold-blooded fish and the metabolism of Angelfish is controlled by the varying temperature. At high temperatures, the metabolism is high that results in the lowering of the lifespan of the Angelfish. Accordingly, the life span of Angelfish is dependent on the temperature of water they live in. > The original habitat of freshwater Angelfish is the Amazon river and its main tributaries in South America. > The sea-water fish are found in oceans in the southern hemisphere. > The average height of the Angelfish is 6 inches. The aquarium Angelfish is 4-6 inches in height. Some Angelfish have height more than 6 inches. The pH level of water should be 6-7.5, for breeding Angelfish. > The Angelfish is a natural carnivore and prefers bloodworm and black worms. Living insects, brine shrimps and insect larva also form a part of the food of Angelfish. > Most of the Angelfish species come from river water, so they require soft water. > The average temperature of water required is 74 degree Celsius to 84 degree Celsius. > The freshwater Angelfish are most commonly kept in freshwater aquariums. 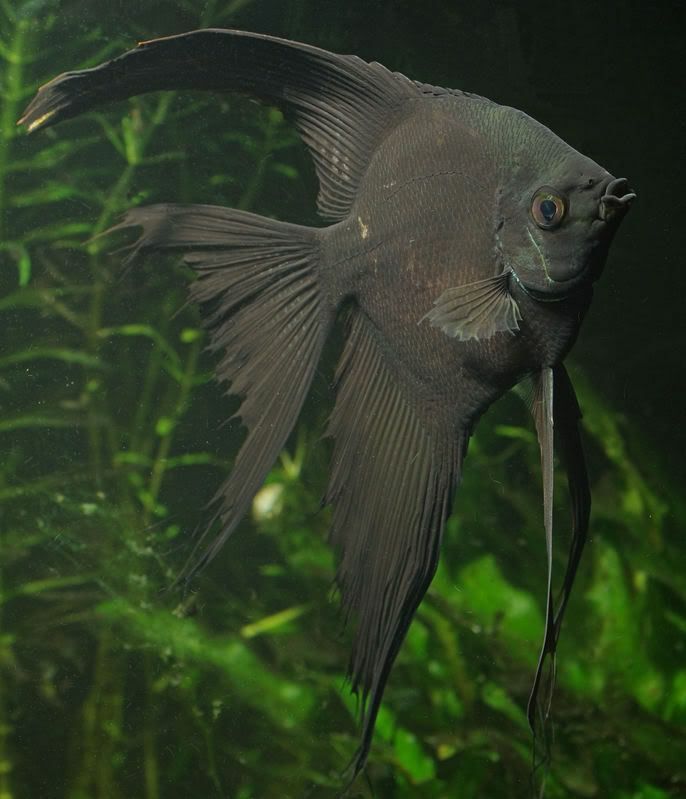 The Angelfish is said to recognize the owner of the aquarium.Small species of Angelfish like Centropyge adapt easily to the aquarium atmosphere. > The differences in the sexes of Angelfish are not differentiable, at any time, except the breeding period. > The female Angelfish lays about 1000 eggs on the surface of plants and rocks. The parents guard the eggs carefully and the eggs hatch in 24-36 hours after they are laid. > The young fish stay on the plants for 4-5 days and then they are moved to pits by their parents. When they are shifted to the shallow pits they are fed with sea organisms like the roftiers. The Angelfish are a found in numerous varieties, colors, shapes and sizes. These were some of facts about the beautiful Angelfish.